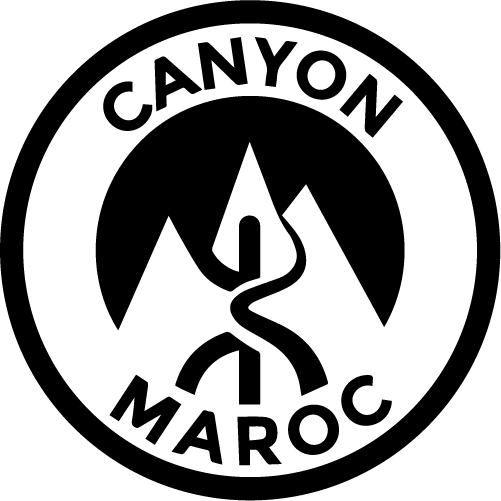 Outstanding canyon - Canyon Morocco - Canyon in the region of Agadir. VERY BEAUTIFUL CANYON WITH AN EXCEPTIONAL FINAL! and it proposes 3 different atmospheres !!! We arrive in a chaos (huge scree with big blocks) and where begins the source! Important Info: This Canyon flows all year long! We will have lunch at this place. This part is very interesting and playful because we bypass, de-escalate these big blocks. We come out of chaos and begin to draw beautiful and large blue basins! the final is exceptional with jumps (not mandatory) and a little abseiling to finish in a beautifully boxed and a swim of about 80 m.